Truth by Kbaig: “Tragedy of Fall of Dhaka” How Long Will We Hide Realities from the Nation? 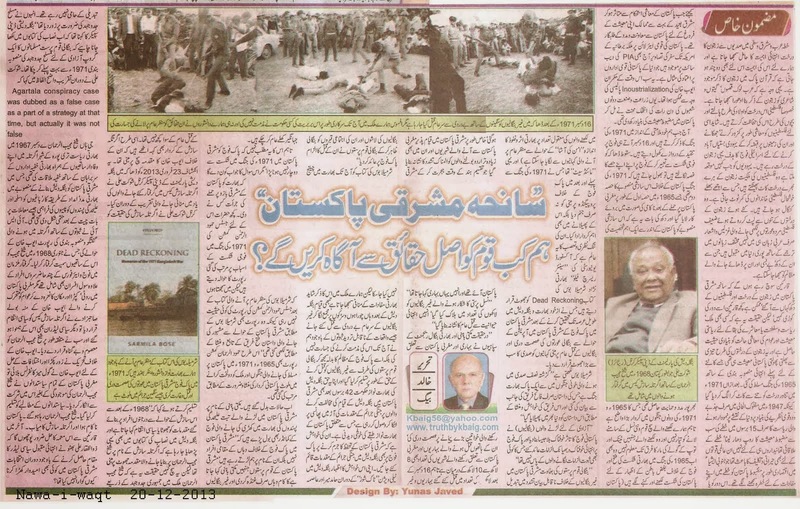 “Tragedy of Fall of Dhaka” How Long Will We Hide Realities from the Nation? Why our govts and media remains silent over massacre of non-Bengalis in the hands of Mukti Bahni? In the Arab and Middle Eastern region, olive has a special importance and especially for us Muslims its importance is further increased as it has been mentioned in Holy Quran as well. That is why folk stories, songs and poetry of Arabic region are incomplete without the Olive. Especially Palestinians, they take care and bring up the Olive trees just like as their children. Perhaps this is the love of Palestinians with Olive or the strategy to economically destroy Palestinians that Israeli soldiers cut down or destroy Olive orchards wherever they get a chance to do so. This destruction of olive orchards forces many rich Palestinian families to beg for livelihood; their elders and women cry embracing cut-down trunks of the Olive; many stories and poems that had been written in Arabic over the loss of these families in the form of destruction of Olive and their love for Olive had been translated to different languages which express the sufferings of innocent Palestinians. One may get confused that why I have mentioned Olive of Palestine in the story of fall of Dhaka but the bitter reality is that in order to weaken or destroy any country destruction of its economy is necessary first step and this was the rapidly growing and blooming economy of Pakistan just like as Olive tree for which as the first phase of plan to cut and destroy it the war of 1965 was imposed. Afterwards in the 1971 war the grown up tree was cut down and separated from its trunk. Because the country entrapped in the clutches of the problems like shortage of finance, lack of technology and resources that got independence in 1947 on the base of Two Nations Theory, had become rapidly growing economy of the region which was not acceptable for the countries dreaming to be the big boss of the region and for those international powers as well who looked a strong Pakistan as a threat to their interests in the region. Recall that time when impressed by the rapidly growing economy of Pakistan, many Far-East countries have requested for support and guidelines form Pakistan for improvement of their economy. The pictures of journey of Queen of Britain via Pakistan International Airlines (PIA) from Britain to USA are still present on the internet which is an evidence of trust of the world over the Pakistani national departments. All this became possible due to the Industrialization Policy of the ruler of Pakistan at that time i.e. General Ayub Khan. In this way Agriculture and Industry of Pakistan worked hard to lay foundation of a stronger Pakistan. Now when we recall the tragedy of Fall of Dhaka in the self-condemnation manners and open up fronts of criticism against army; claim fall of Dhaka as defeat of our military to give way out to our anger we ignore that war of 1971 was 2nd part of that great conspiracy which was put into action after failure of first part in 1965 war. The most tragic aspect is that this conspiracy was supported internally by a very important personality in Pakistan who played a vital role in both 1965 and 1971 wars. However, our writers will never tell the truth to the younger generations while those writers who are even unaware of the difference between range of a tank’s round and round fired by an artillery gun, they also express their anger against Pakistan army by claiming 1965 war as defeat of our army. The number of Indian sponsored writers has now become evident after stories of AMAN KI ASHA drama has come to the front. This was the same “mindset” that before 1971 war and afterwards not only started hatred against Pakistan army but left no stone unturned to spread this hatred. The extreme of their narrow mindedness is that they are declaring book of Sarmila Bose, an Indian origin research fellow of Oxford University of America, Dead Reckoning as a lie which she has written after a long self-research; in this book she has proved all the stories of gang rapes of Bengali women and murder of Bengalis in the operations in East Pakistan by Pak-Army, are fake and based upon false propaganda. She claims these stories as the greatest lie of the century. “Wars of past century that were full of bloodshed one of them was Pak-India war whose story has been told only by the victorious party and this story has been molded and propagated according to its wishes”. “Those fighting for freedom portrayed Pakistan army as a terrible beast and alleged Pak-army for such crimes for which they had no evidence”. “Treason of Bengali Nationalists converted into unexplainable violence against non-Bengalis, those who have come from Western Pakistan and settled in East Pakistan; especially those who spoke Urdu and migrated from different parts of India to East-Pakistan, they were also known as Behari”. 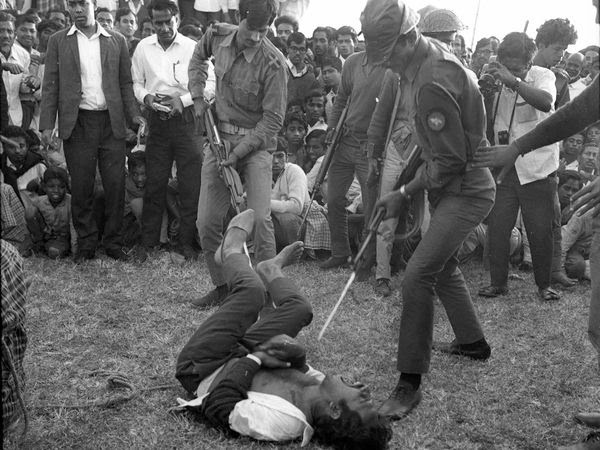 “Hundreds of thousands of non-Bengalis became target of racism and killed in cold blood”. 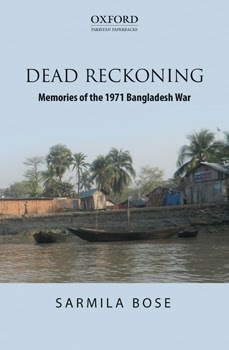 “Actually Mukti Bahni and soldiers of Indian Bengal Regiment raped Behari and women from Western Pakistan, the number of those murdered in the hands of these invaders is more than 1 million, however, after 16 December 1971 dead bodies of these non-Bengalis murdered by Mukti Bahni and Indian soldiers were buried in mass graves and portrayed as Bengalis murdered by Pakistan army”. This book of Sarmila Bose has not been challenged so far in India but in Pakistan perhaps mentioning this book is against the interests of India. 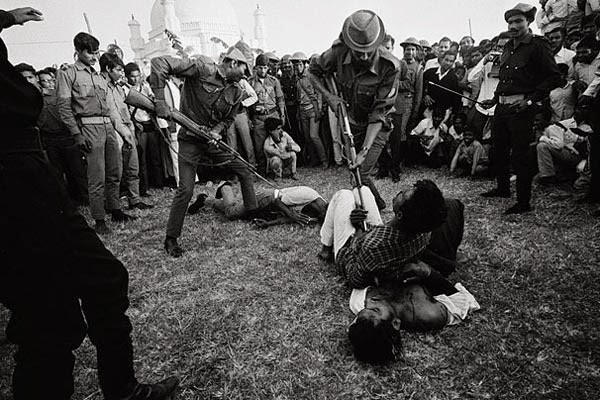 That is why since fall of Dhaka despite of having numerous incidents of mass murder of non-Bengalis after gathering them in Chowks and other public places, we have not dared to condemn these inhuman acts of Mukti Bahni. 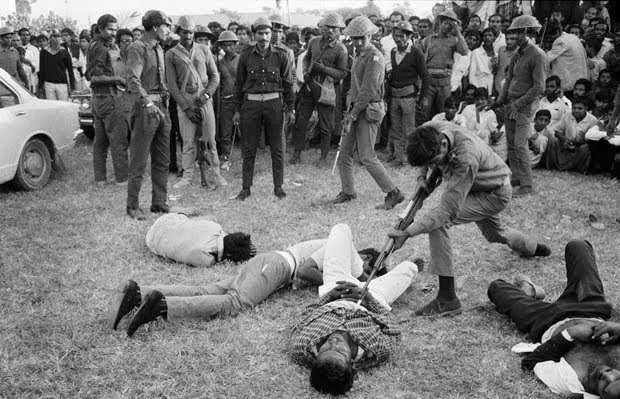 Not only we have practiced criminal ignorance over this massacre of Pakistanis in the hands of Bangladeshi murderers but also provided justification to these massacres by claiming it as a reaction of Pakistan Army’s cruelties. In the other words murder of non-Bengalis was accepted as a right of Mukti Bahni and Indian soldiers and now Bangladeshi govt. after 42 years is exploiting this right given by our traitors to put supporters of Pakistan on trial for war crimes and hanging them; the reaction of Pakistani traitors and their happiness worth watching. They want that trial of war crimes should be started against Pakistan army for defending Pakistan in 1971 war. Hamid Mir and Asma Jahangir have expressed their enmity and will to prosecute Pakistan Army for the crime of defending Pakistan. However this does not mean that Pakistan army was not defeated in 1971 but who will answer this question that who encouraged and provided support to India to attacks Eastern Wing of Pakistan? Some people quote the report compiled by Hamud Ur Rehman Commission which was established to find out the facts for military defeat in 1971 but after the book published by Sarmila Bose, the Hamud Ur Rehman Commission’s report has lost its value because as Sarmila Bose says that stories of victory were written according to the victorious party in the same way the Hamud Ur Rehman report was also written according to the will of the character who supported India in imposition of 1965 and 1971. Now time has changed; even the commander of Tibetan army raised by India that was used in Bangladesh as Mukti Bahni had broken the silence as well that in the name of Mukti Bahni in spite of local people they (Indian raised Tibetan terrorists) fought the war under the garb of Mukti Bahni. Local gangsters were involved in looting and murder of non-Bengalis only. In the same way if we look at the characters of Agartala conspiracy they are confessing that Ayub Khan’s trial against them was based on truth. This revelation was made on 23 February 2013 during a celebration in the memory of arrest of Deputy Speaker Col Shaukat Ali of Bangladeshi Parliament in Agartala Conspiracy. Col Shaukat Ali confessed the reality of Agartala Conspiracy by saying that cases registered after 1968 under this conspiracy are known as political revenge or fake and same is taught into the curricular books of Bangladesh that case registered against Mujeeb Ur Rehman was based upon political revenge, but this is not true Mujeeb was not supporter of change in the country through democracy. He preached armed struggle and treachery. 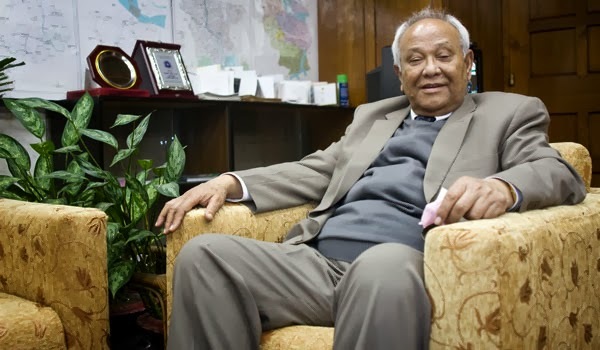 Bangladeshi Deputy Commissioner said that now this should be written in the books that nationalist group of Bangladesh has long ago planned for armed struggle for freedom long before 1971. Shaukat Ali during the ceremony clearly said, “Agartala conspiracy case was dubbed as a false case as a part of a strategy at that time, but actually it was not false”. Yes! Mujeeb has met with Indian officials of Indian secret agency along with his loyal friends secretly at Agartala in which planning, supply of weapons, training, infiltration and financial support to Mukti Bahni was finalized. ISI provided Ayub Khan the details of this meeting along with evidence; so in January 1968 Mujeeb was arrested along with his friends. Arrested persons included few on duty officers of Army and Air Force, Civil Officers; but foster son of Ayub Khan who had mobilized public in western Pakistan through the slogan of Roti, Kapraa, Makan (Bread, clothes and house), claimed these arrests as political revenge and other politicians also started supporting him and these politicians collectively claimed that Mujeeb was innocent. When disputes grew stronger and Ayub Khan called Round Table Conference for solution of these disputes, politicians of western Pakistan said that they will not participate until Mujeeb is not allowed to participate. Demand of politicians was accepted, Mujeeb was released, Pakistan got defeated and Agartala Conspiracy succeeded. In the end I would like to ask that if Zulifqar Ali Bhutto was such a famous politician than why did not he appoint any contestant from East Pakistan in the elections.